Defiance has won numerous awards and championships, including the 2013 and 2014 IAO Supreme Champion. But his accolades don't begin to tell the story of this truly exceptional male. The story begins, of course, at the beginning -- with his genetics. His dam's lineage has been proven over multiple generations to produce superior alpacas. Snowmass Maree Love, Snowmass Delightful Duet and Snowmass Freedom are all of this line. 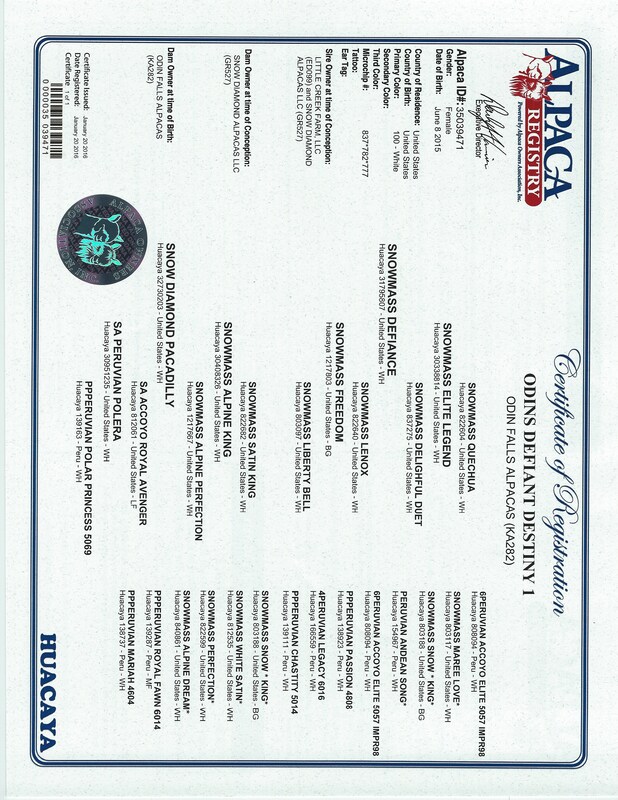 Defiance's paternal lineage contributed advanced heritable characteristics, like those expressed in his sire, Snowmass Elite Legend, who remains the North American leader in the number of years he has been the Herdsire of the Year. 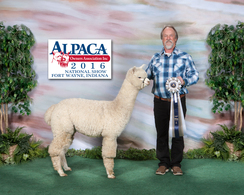 Elite Legend's sire, Snowmass Quechua, was Herdsire of the Year before him. And now Defiance embodies the next level of advancement in this ever-exceptional paternal line. The story is at its best when it tells of the heritable characteristics that make Defiance great. All of the traits we breed for come together in this male. New standards of sustained fineness, consistency, brightness and density define a consistently superior fleece that hardly changes at all from one year to the next. (See fiber stats below.) His exquisite fleece is supported by an overall perfect phenotype. This is one beautiful male. The story of Defiance is still being written, as he passes his advanced characteristics on to his stunning progeny. Take advantage of the opportunity to make history with this prepotent male. 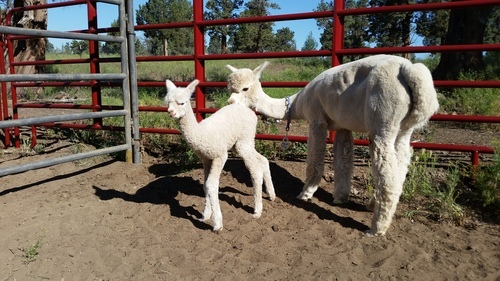 Defiance is co-owned by Snow Diamond Alpacas in Oregon and Little Creek Farm Alpacas in New York, and breedings, offspring and bred dams will be offered at both farms. 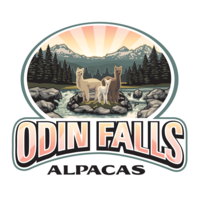 Choose your location and choose to write a new chapter in the history of American alpacas. Wait until this one hits the Show ring this Spring season. 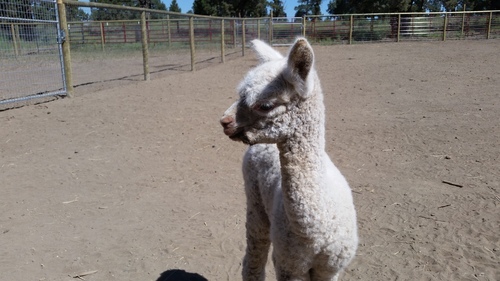 Destiny was the first cria to be born on our new farm, popping out at 20 lbs., ready to go. 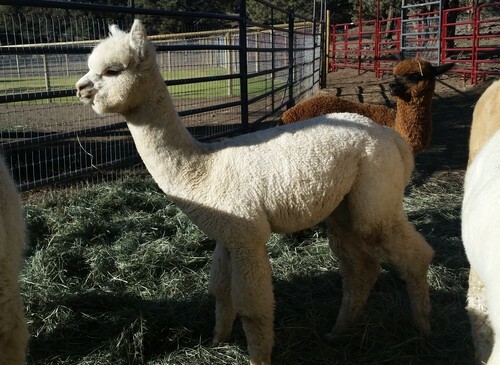 Right from the start, she had that perfect conformation, beautiful straight legs, and really tightly curled fleece. By the age of 3 months, she had grown to 60.8 lbs., and to 75 lbs. at 5 months old. Wow!!! Destiny has it all when it comes to fleece. Long staple length, incredibley brilliant white, Dence yet really fine, with a beautiful consistent staple.